When we think about where we live, usually our ideas start with political boundaries—we’d say we live in a particular state, city, or town. Ask about a neighborhood, sports team loyalties, or regions not defined by borders, though, and it might get a little fuzzier. In densely settled places like the East Coast, sprawl can make it hard to draw lines around places, too. Where in New Jersey does the New York City region end and the Philadelphia region begin? These larger urban areas are sometimes called “megaregions,” and in a new paper, published in PLOS ONE, Garrett Dash Nelson, a historical geographer from Dartmouth, and Alasdair Rae, an urban analyst from the University of Sheffield, teamed up to identify them across the United States, using commuting data and a computational algorithm. 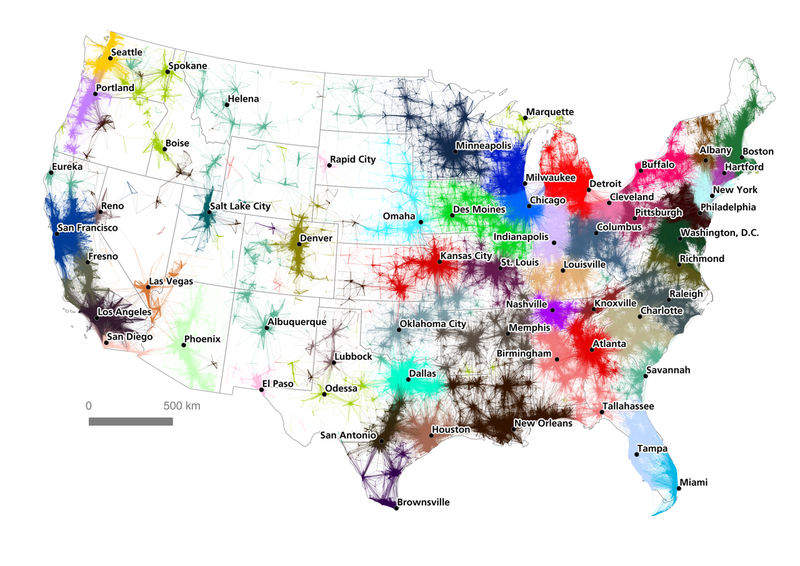 Essentially, they used data describing more than 4 million commutes to look at how small units of place—census tracts—are connected into much larger units of place. One of the results from their algorithm is the map above, which shows how the country is divided into economically entwined regions that don’t conform to city or state boundaries. Pittsburgh’s region spills into Ohio and West Virginia; Denver’s tips over the border into Wyoming; and Oklahoma City’s reaches into Missouri and Arkansas. “This area really is coherent and independent in a certain sense, for it has very weak commuter relations with neighboring communities,” the researchers write. But, they wonder, does that mean it should be considered its own region, on this basis alone? It’s a coherent view of the country that resonates on an instinctive level, even if some parts remain curious, like the wide region out West that expands over Salt Lake City and sneaks across Idaho and Nevada into California that doesn’t get a name. Or the part that’s simply labeled Deep South. Apparently there are geographical quandaries that even humans and algorithms together can’t solve.